Apple’s Thunderbolt Display was one of the best monitors on the market before it was discontinued. You may not be able to find one for sale as stock dwindles down. The external Thunderbolt Display has always been priced fairly high. Is there any reasonable alternative or replacement for professionals and enthusiasts who want the best at a lower cost? Yes, but don’t be too quick to get just any low priced external 27″ LCD display you see. There are some very important Thunderbolt Display specifications that you want to be sure to match. I’ll touch on a few key specifications and then list real alternatives you can really count on to give you a reasonable Thunderbolt Display experience without the price tag. 1. Get the correct resolution. 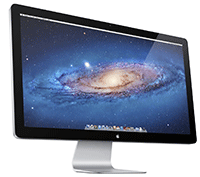 Apple’s Thunderbolt Display is a 27″ display with a pixel resolution of 2560×1440. That’s also known as “wide quad HD” or WQHD. This is far beyond 1080p or any typical “HD” or “Full HD” displays that only have a pixel resolution of 1920×1080. 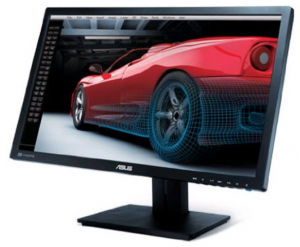 Most of the inexpensive 27″ external monitors on the market are 1080p displays. That will not give you the Thunderbolt Display experience. You will literally have far fewer pixels in front of you. You will lose text and graphics detail, smoothness and precision if you go with a simple 27″ 1080p display. Apple’s Thunderbolt Display gives you 109 pixels per inch compared to an ordinary 27″ HD display that only has 82 pixels per inch. 2. Get the correct backlight technology. Apple’s Thunderbolt Display uses LED backlighting. All flat panel “LCD” displays have backlighting or you would not be able to see anything on the screen. Traditionally, LCD panels had fluorescent backlighting. Fluorescent lights are Ok but they take some time to achieve their full brightness. In contrast, LED lights are instantly at their target brightness when they are activated. Plus, LED lights have a longer lifespan. You want an LED backlit display so that when you turn it on and use it, it will be stable in terms of brightness, color and contrast immediately and not gradually increasing in brightness. 3. Get the correct viewing angle specification. One of the things that has set apart most of Apple’s desktop and notebook displays is their use of IPS or in-plane-switching technology. The benefit of IPS in a display is that color and contrast is very stable no matter what angle you view the display. In other words, moving your head or your body to most any angle to the screen, or looking over someone’s shoulder, the image stays the same. The next time you are in front of an inexpensive external display, move your head side to side and up and down while looking at the display and you will see the image’s color and contrast fluctuate. You don’t want that. You want a 27″ display that actually has 178 degree viewing angles. 178 degrees is almost 180 degrees. That means you can be way “off-axis” of the display, and almost sideways from the screen, and still see the correct colors and contrast on the screen. 4. You can’t match every feature that Apple’s Thunderbolt Display provides. But, you can match the display quality of the Thunderbolt Display, which I think is the most important consideration. However, you won’t find another display that matches every other feature. For example, only the Thunderbolt Display comes with a built-in webcam and microphone, a “thunderbolt” connection, and a cable that can directly charge a MacBook. The video connection on the Thunderbolt Display doubles as both a video and data connection with a Mac or MacBook that is compatible. That means USB, ethernet and firewire traffic can run through the same cable along with image data so the Thunderbolt Display acts as a device hub. The Asus also gives you LED backlighting, the correct WQHD resolution, and is more physically adjustable compared to Apple’s display. Highly recommended and less than half the cost of Apple’s external display. 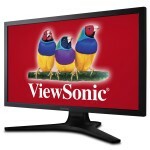 This specific Viewsonic also gives you LED backlighting, the correct WQHD resolution, and is more physically adjustable compared to Apple’s display (has height, tilt and swivel adjustments). It allows you to pivot or rotate the screen to “portrait” mode as well. Very highly recommended with exceptional factory pre-calibrated color accuracy. A bit more expensive than the Asus but still a good deal less than Apple’s external display. 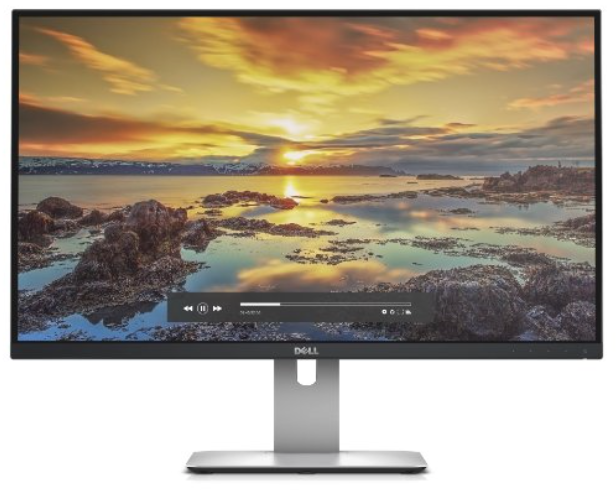 This specific Dell 27-inch display also gives you LED backlighting, the correct WQHD resolution, and is more physically adjustable compared to Apple’s display. It allows you to rotate the screen to “portrait” mode as well. Highly recommended.